Osborne Bull There are 33 products. 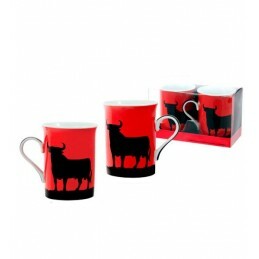 Collection of accessories with the famous silhouette of the Toro de Osborne: sets of cups, pocket mirrors, spectacle cases, figures, pens, shirts, caps, clips, mirrors, Hangers, swetshirt ... All products are licensed by the Osborne Group. 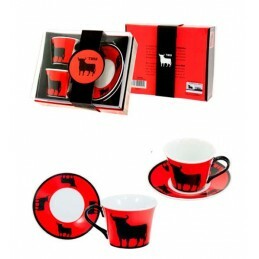 Set of two coffee cups and two saucers of the Toro de Osborne. The cups have a measure of 3.3 x 2.5'' high and the dish has a diameter of 5.5'' (big) and 6.5 cup diameter x 5.5 high and 11 cm diameter plate (small). This is an official product of the Toro de Osborne company. Replica of advertising fence Toro de Osborne, black lacquered metal in three sizes. Small: 8.6 and 8.4'' base maximum height Medium: 14.8 base and 13.7'' maximum height Large: 21.1 base and 19.5'' maximum height Licensed product of Toro de Osborne brand. 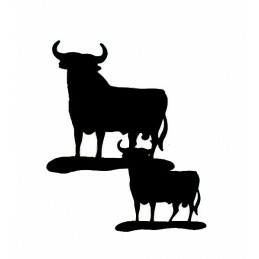 Toro de Osborne silhouette in lacquered metal. Available in two sizes: Small: base 4.3 x 3.9'' maximum height Large: base 6.2 x 5.9'' high maximum Licensed product of Toro de Osborne brand. Mini Toro de Osborne watch. Small alarm clock, available in three dial colors: black, red and red / yellow. IMPORTANT: when ordering, select the color of the sphere, not the clock. Hang bag Toro Pasion by Toro de Osborne, made ​​of metal, very practical to hang your purse on the table. Gift box included. Official product by Toro de Osborne brand. 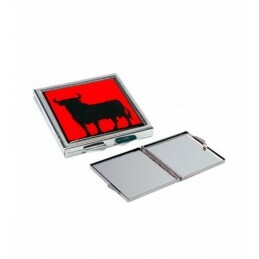 Purse mirror from Toro de Osborne from Toro Pasión (Toro Passion) collection. is chrome and has clip closure. Licensed product Toro de Osborne brand.NOTE: in the picture you can see some bubbles in the lacquer of the bull, is because it has a protective plastic. Travel alarm clock Toro de Osborne. Original and practical watch for travelers who love the world of bullfighting, is stored in a leatherette pouch briefcase shaped, takes up no space. 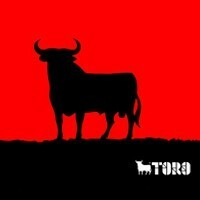 License product of Toro de Osborne brand.